AquaSub Travel organizes many group scuba vacations to top destinations around the world. These trips are lead by one of our PADI Professionals who will ensure you have a great scuba trip and can also do any training with you. Use our online booking engine to book flights, hotels and package vacations. Or contact us and we'll assist you in booking your dream vacation. AquaSub Travel is a sister company of AquaSub Scuba Diving Centre, a PADI 5 star Instructor Development Centre. We love scuba and we love to travel. You can book a spot on one of our group scuba vacations or we can assist you in booking your dream vacation. This is our most popular trip. We have monthly group trips there always lead by one of our PADI Professionals so you can get certified or take the next level in your training. 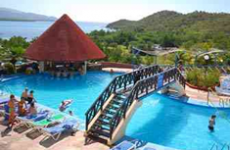 Our trip is based on an all-inclusive SunWing package and we add 5 days of diving. AquaSub Travel is an independent owner, affiliated with TPI.